Conquer unsightly splotches on your driveway, patio, and garage floor to restore the handsome looks of those hardworking surfaces. Concrete driveways, patios, and garage floors may take a beating, but that doesn’t mean they must show the signs. While these rugged surfaces are bound to receive their share of errant oil, paint, rust, mud, foliage, or even “accidents” from family pets, you can banish stains and restore your concrete’s good looks with a little elbow grease and know-how. 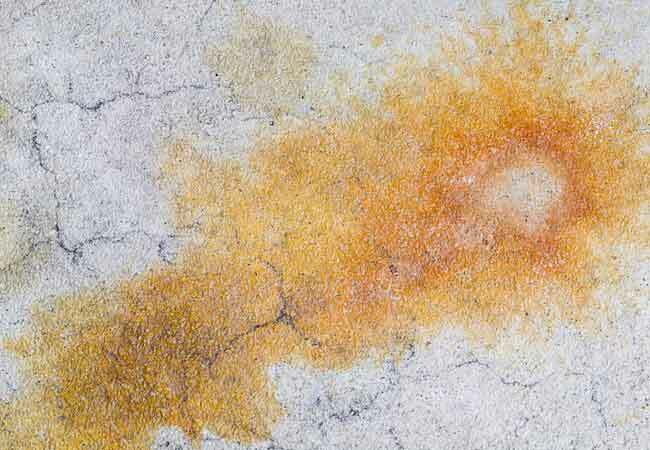 Read on for tried-and-true treatments that really work on the most common culprits for concrete stains. 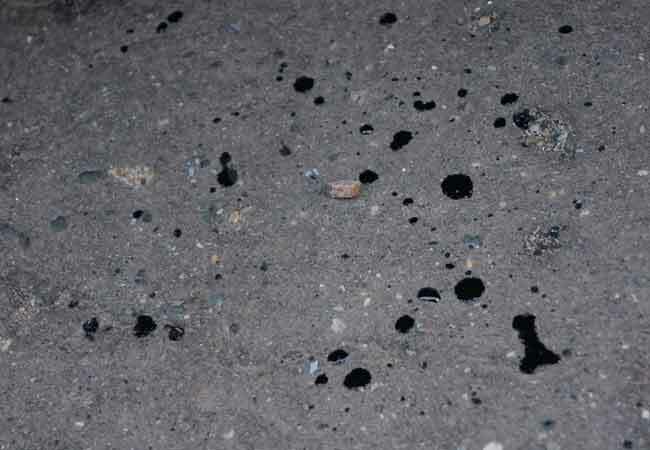 Oil spills leave unattractive black splotches on concrete flooring that can also track into your home from the soles of your shoes. Attack stains by soaking up as much oil as possible before it penetrates. Pour clay or “clumping” cat litter (but not crystal or clay alternatives like corn) over the entire stain and work it in with a stiff broom or brush. Leave the kitty litter in place for at least an hour—or overnight for an extensive or old stain—and then sweep up the mess. 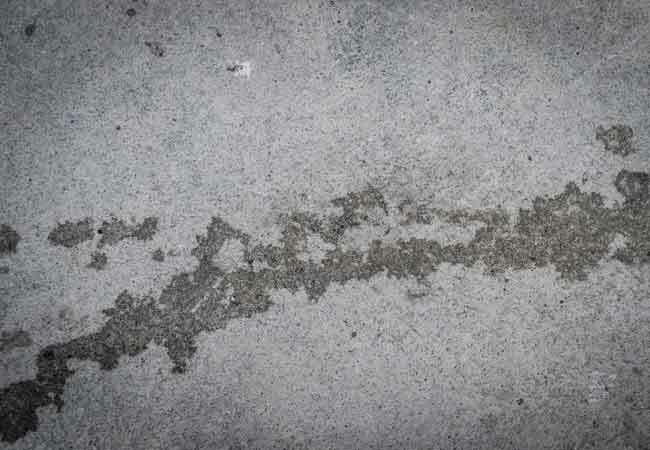 For some new or small concrete stains caused by oil, this is all the treatment you may need. If the concrete still bears a mark, don rubber gloves and goggles and mix one cup of TSP (trisodium phosphate) in a gallon of hot water, then pour the solution over the blemish. Let it soak in for at least 30 minutes, and then scrub with a stiff nylon brush. Finally, blast the spot with your hose set to the highest pressure. Repeat the process as necessary on deep-set stains. While a slight hint of color might always remain if you spill a large amount of paint onto unsealed concrete, you can remove most of the mess. If the stain is relatively fresh and small, put on rubber gloves and eye protection before mixing one cup of TSP into a gallon of hot water. Pour the solution over the paint, work it into the stain with a stiff, long-handled brush, and then rinse with your hose set to the highest flow. Large or old paint spills need a chemical paint stripper—and that requires eye protection, chemical-resistant gloves, and a respirator (best choice) or a dust mask (suitable only if working in an open area with good ventilation). Mix paint stripper with an absorbent material such as baby powder, diatomaceous earth, or finely ground clay kitty litter until you get the consistency of thick paste. Use a brush or thick sponge to smear the paste over the entire paint spill and allow 20 minutes of dwell time. Use a plastic paint scraper to remove the paste and loosened paint. If there’s still quite a bit of stain, spread the paint stripping paste again and leave on for half an hour before again scraping it away. Finally, sprinkle a scouring powder like Comet over any remaining stain, scrub thoroughly with a nylon brush and water, then rinse the area with a strong blast from your hose. Rusty metal outdoor furniture, plant pots, and tools can transfer that ugly orange-brown color to concrete. While those marks can be difficult to conquer completely, these next treatments are sure to greatly reduce them. For old or large rust stains, use commercial rust remover. Because these products contain much more powerful acid than vinegar, protection for your eyes and hands is a must. Follow the application directions on the package and let it dwell for 15 to 20 minutes (or the length of time recommended by the manufacturer) and then blast the area with your hose. Repeat the process if necessary. It’s easy to sweep away a light coating of dirt, but when mud or soggy fallen leaves sit on concrete for lengthy periods, they often leave brown stains behind. To remove, pour one-eighth of a cup of liquid dishwashing detergent into a spray bottle, then top off the bottle with warm water and shake well. Spray the concrete stains with the soap solution, let it sit for 10 minutes, and then scrub with a stiff nylon brush. Once the stain lifts, hose the area until the spot is completely gone. If Fido has been doing his business on your concrete patio, driveway, or dog run, those pet stains no doubt smell as bad as they look. To clean up after him, first scrape off dried droppings with a metal shovel or poop scooper. Then prepare a cleaning solution of one-eighth cup liquid dishwashing detergent, one-half cup baking soda, and one gallon of water. Mix thoroughly, and then pour over the stained area. Use a nylon scrub brush to work the solution into the stain, scrubbing until the marks are gone, and rinse thoroughly. To treat any lingering odor, use an oxygenated enzyme pet stain cleaner, which you’ll find at just about any pet store or home improvement center. Some enzyme cleaners come ready to use, others require mixing per the instructions on the label. Spray the entire affected area, and continue to spray as needed to keep the concrete wet for at least an hour. Rinse with water and let the spot air dry, repeating if necessary.